Ok- Tomorrow morning, I am leaving for NC and VA for 6 days. So, I am going to put the blog on hiatus until I get back. The shop is also closed. Once this show is over, and I can get back to normal days, I will start on my new blog direction. Have a great weekend and a great next week! I have decided that my little studio needs a serious overhaul. Unfortunately, in about 7 months, we plan to put our house on the market. So, obviously, it is not worth the money to actually do that. Like a lot of artists, I have a lot of stuff, and very little space for it. I am going to have to start the 27 Fling Boogie again. I imagine that like every time in the past, if I do actually start on it, I will probably end up spending days trying to get it arranged to my liking. Thinking about this has lead me to think about my dream studio. If money were no object, I would love to have a gigantic room- maybe 60 x 60- or even bigger! I would have no carpet anywhere in it. I would have one entire wall of windows (and someone to clean those windows!) I will have one entire wall of peg board and shelving. I want big work surfaces... at least 5x5 foot tables probably more like 5 x 10. I want to have work zones for my different major media. I want tons of light, bright cheery colors on the wall, and an awesome cooling system to keep all of that light from making the studio so hot! I am not yet sure what the answer is, but I would have some super fantastic way to keep all of my stock well displayed, easily accessible, but simple to pack up for a show! I could go on dreaming about this all day. But that is really not a productive use of my time! I keep a dream house book. It is where I write down, sketch, or tape a picture of anything I see that I like, imagine, or just really want. Once upon a time, I had a 4 inch binder full of these ideas, but that book was "lost" in our move to Charleston. I have started a new one. I think I am going to have to give my dream studio it's own chapter in the book! What are your dream spaces like? Don't forget to go check out Jubillie. OK, OK, I know. These are annoying when they come in email. I try not to forward them. But, For some reason, last night as I was surfing the Internet, I came across this list on someone else's blog. I decided that I would do it, and make an offer to you. If you comment with the three things about you, AND LEAVE ME CONTACT INFORMATION, I will send you a code for 20% off at JUBILLIE. - Is Pina Coloda a Food? Don't forget... you fill it out too, and give me a way to contact you, and I will send you a code for 20% off of JUBILLIE. I have decided to revamp my daily plans here. As anyone that knows me can tell you, I am an ADHD kid. Looking back over my last couple of weeks of posts, I think it was pretty clear that I was trying to bust through the boredom of the hole I had put myself in. I am not sure yet what the daily plan will be. I know that it obviously needs to still have some structure, but I am going to try to make it a little less concrete... with a little more room for fun! As for where I have been for the last week? My friends will tell you that I have been absent from everywhere lately! I got chastised by a childhood friend for going 5 days without posting an update on facebook this weekend! I live in Charleston, SC. Besides just being in the hot south, we are also close to the coast... this makes for some bizarre weather sometimes. For the last 2 weeks we have had some huge storms, with lots of power outages and other various strikes. Yesterday, I got a new computer. Hopefully, this new computer will be the end of the problems for a while. On the note of the new computer- now I need to pay for it! So get on over to the JUBILLIE SHOP and buy something! On another note- I have a show this weekend. It is actually part of a Conway, SC July 4th celebration. Why, you may ask, is the 4th of July celebration a week before the actual 4th of July? The answer is... I have no idea. Especially since the actual 4th of July happens to fall on a Saturday this year! However... The have an artisans market, and I will be one of 20 or so vendors there that day. If you are in the Conway or Myrtle Beach area, come by and see me! Tell me that you read the blog, and I will give you a discount! Click HERE for info about the festival. Well, the blog has been awfully discombobulated this week. Next week, I will do my best to get back on track. I have a couple of things I wanted to touch on today. First- there is an upcoming sale that I am taking part in. They month of July will be Christmas In July for the South Carolina Street Team on Etsy. When you are shopping in July, please enter TEAMSC or XIJ into the search to find sellers taking part in the sale. Second- On June 27th I will be a seller at Riverfest in Conway, SC. I am really excited about that. I think I am one of 20 or so art / craft vendors that will be there during the festival. There will be lots of bands and activities from 3 pm - 11 pm. Come out for a visit if you are in the area! Third- Search TEAMSC any time on Etsy to find items by great sellers all over South Carolina! I am leaving town again tomorrow morning. It is family reunion weekend, and there is so much going on. My nephew is graduating from West Brunswick High School on Saturday. Our family is having a birthday party for the 6 people in our family that have birthdays in the first half of the year. Then Sunday we will be going to the family reunion! Big happenings this weekend. I will be checking emails and convos when I get a chance! Let me know if you need anything. As always- if you purchase today at JUBILLIE enter BLOG READER into the message to seller area, and get free shipping! You can either pay and I will refund your shipping costs, or you can start your purchase, and I will send you a revised PayPal invoice reflecting the free shipping. On Tuesdays I generally feature some new (or old) favorite item of mine. But, since I have been away for a few days, I do not have anything new posted. But, I wanted to share this "Made For Me" product that I came across at Target. It is a lock... only, no numbers! Perfect for me! Here we are again. Free Shipping Thursday. Buy something at JUBILLIE and enter "Free Shipping" in the message to seller. I will refund your shipping costs to your paypal account. Or, you can wait a few minutes, and I will send you an updated paypal invoice with the shipping costs removed. 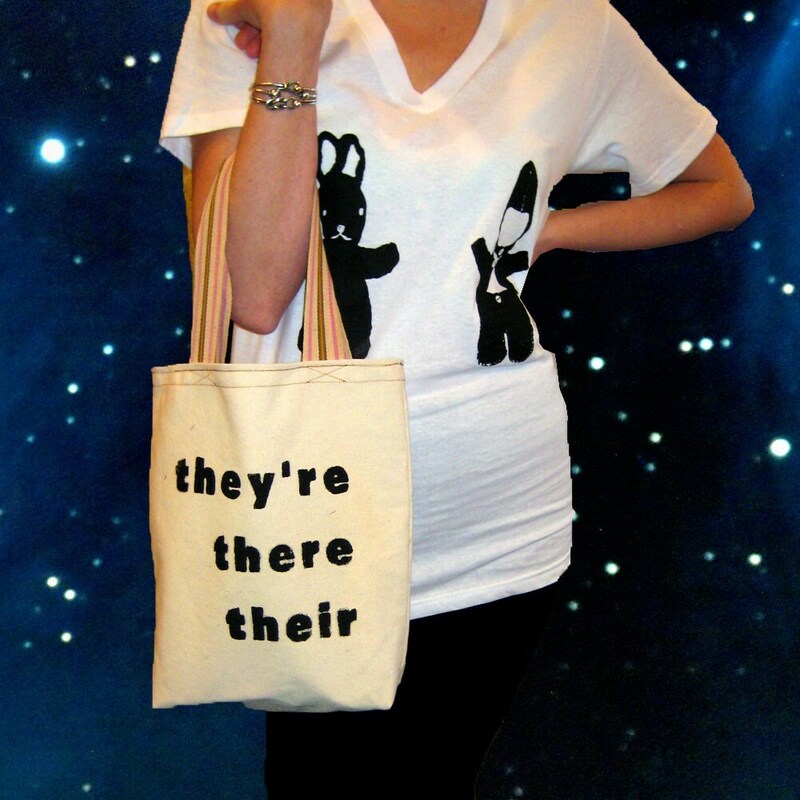 My husband says that I am the Captain of the Grammar Police. I think, in reality, he says that because I correct him. A lot. It is a bad habit that I have, and one that I am constantly working to back off of. But, in my defense, he uses a lot of "words" that don't really exist. And it irritates me! So, I guess that is what makes me the Grammar Police. So, when I was browsing through Etsy last night, I came across this little gem from Etsy seller KingDog. This bag is a constant reminder of grammar! My kind of bag! After you are done checking out this bag, check out the new stuff I put into Jubillie this week. It is not quite ready to go yet, but I am working on stock for a second shop. I could not really figure out how to market jewelry and home decor / wall art kind of stuff with each other. So, there is a second Etsy shop in the works for me. I will post the link to it when it is open, and then the blog posts will more evenly span both shops. I am an artist. At least in my own mind! I am taking advantage of the opportunity to make a living with my art. I hope I can continue it for a very long time!